The Olympus Objective Illuminated TIRF was purchased by the Department of Anatomy & Structural Biology for the new Biophotonics Innovation Laboratory. After two years of development of the instrument, it has been moved to the AIF for use by the entire College community. TIRF is ideal for looking at molecules within 200 nm of the substrate. Applications include imaging adhesion or membrane associated molecules in live cells and in vitro filament assays (e.g. f-actin or tubulin). The current TIRF microscope system is an inverted Olympus IX71 microscope for use with coverslip bottom dishes, chambers or coverslips mounted on slides. There are lasers at 436, 488 and 543 nm for excitation of CFP, GFP/YFP/FITC-like green probes and red probes. Standard magnifications are with 60 N.A. 1.45, 100X N.A. 1.45 or 150X N.A. 1.45 lens with standard coverslips or 100X N.A. 1.65 with sapphire coverslips. The camera is a high speed 512 X 512 EM Andor. An external filter wheel changes fluorescent emission wavelengths rapidly. In late 2007 there will be substantial upgrades. The lasers will be changed to 436, 488, 561 and 640 nm. Switching from TIRF to/from widefield may be automated. Please contact Michael Cammer for an appointment to discuss your experiment or to try the technique. We are happy to image your material with this technique on an evaluation basis. Let's see what TIRF can show you about your biological system! Macrophages courtesy of Dianne Cox. GFP-f-actin in live MTLn3 cells. GFP-paxillin in live MTLn3 cells. 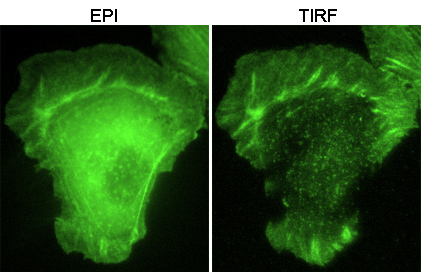 In standard epifluorescence details at the bottom surface of the cell, where the cell directly apposes the substrate, are obscured by the fluorescence through the entire depth of the cell. 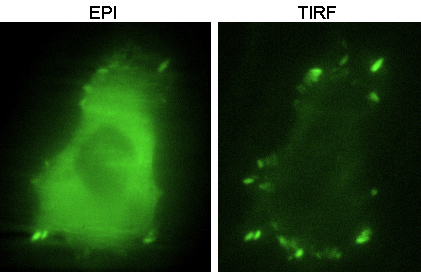 TIRF increases the contrast of structures less than 200 nm from the surface because only these fluorescent molecules are excited; the rest of the cell is in the dark. Neither deconvolution nor confocal may yield as high resolution normal to the surface.